Peter Gahn (*1970, Germany) graduated instrumental and electronic composition in Essen, Germany and Tokyo, Japan. He has received the 26th Irino Prize 2005, first prize of Stuttgart Composition Prize 2013 and was artist in residence at ZKM Karlsruhe, Cité Internationale des Arts, Paris Seoul Art Space Geumcheon, and German Academy Rome, Casa Baldi (2016). 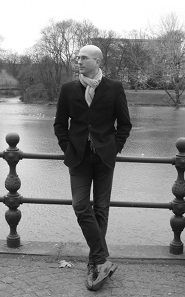 His works includes solo and chamber music, works for orchestra, electronic music, as well as collaborations with visual arts, performing arts and literature and have been presented in concerts and international festivals in Europe, East Asia and South America by ensembles as Ensemble Modern and the Stuttgart Radio Symphony Orchestra. Peter Gahn (*1970, Germany) composes solo, chamber and orchestra music with and without electronics, as well as collaborations with visual arts, performing arts and literature. His works have been presented in concerts and international festivals in Europe, East Asia and South America. He received international prizes and artist in residences in Japan, Germany, France and South Korea.